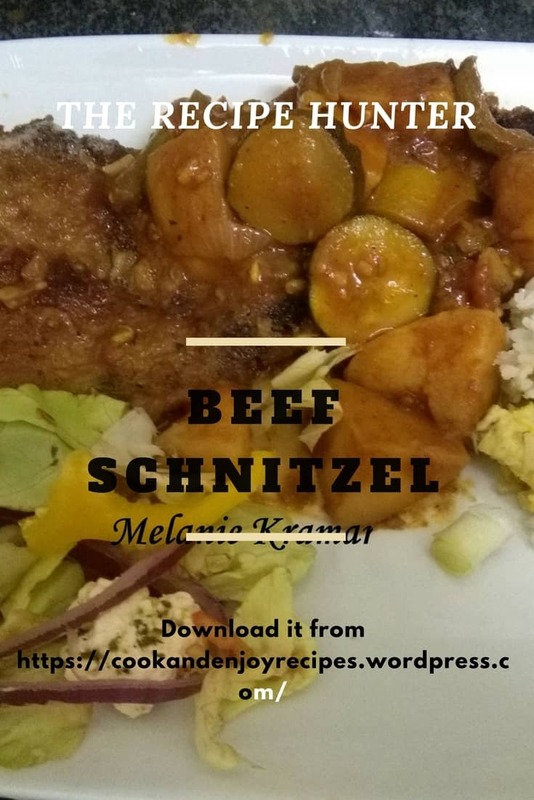 I’m always making chicken schnitzel but last week took out tenderized steak so opted for Beef Schnitzel instead which I served with Zucchini and Potato Ratatouille (which was an amazing hit surprisingly) and Egg Fried Rice. Arrange 3 bowls with 2 beaten eggs, splash of milk, salt and pepper. The second bowl with 2 cups flour salt, pepper and cayenne pepper. The third bowl with 2 cups panko breadcrumbs or fresh, likewise seasoned. Coat the steaks in flour, shake off excess, then egg, then press into the breadcrumbs. Set aside for half an hour then shallow fry 3-5 minutes a side till golden. Add ½ TB oil to wok. Add the eggs, scramble and remove. Add peas and carrot with pinch of salt. Stir a few minutes with a pinch of salt. Add cooked ham (chicken, beef, pork or shrimp). Add cooked rice stir one minute and remove. Add bean sprouts and stir one minute. Add fried egg then mix through. Add soya sauce and sesame oil and mix through. Add spring onion and mix. Heat the oil in the pan. Add mustard seeds. When they pop add the onion and fry till translucent. Add the garlic/ginger paste, cumin and coriander powders. Fry for a minute. You might need a splash of boiling water. Add the potatoes and all the seasoning and the tomato, and passata. Simmer until the potatoes are almost cooked add the zucchini. Cook until zucchini and potatoes soft.